Consumer Confidence Index, or CCI, is one of the most interesting and reliable surveys for reflecting on and predicting the future of the economy. Reviewing the current economic status of consumers and their own expectations for the future is very telling and as the largest contributor to economic growth, consumer spending is responsible for up to 75% of GDP. So what happens when that consumer spending drops? The bubble bursts. Recessions don’t come on suddenly – though the effects may feel as though they hit all at once, there are subtle signs for the trained eye well beforehand. Interest rate trends are a key indicator. Impending recession is likely if short-term interest rates are higher than long-term interest rates. Another indication is initial unemployment claims for unemployment insurance, revealing that businesses may need to reel in current spending. Perhaps one of the worst instances of unemployment complications was during the Great Depression which brought unemployment up to 25% and remained above 10% even until 1941, almost a decade later. Housing and construction indices can result in action from the Federal Reserve, which can have a snowball effect. In 1980, a recession was caused directly by the Federal Reserve when it raised interest rates to combat inflation. The housing crisis and subsequent Great Recession of 2007 was triggered by the subprime mortgage bubble bursting and spreading through the rest of the economy. 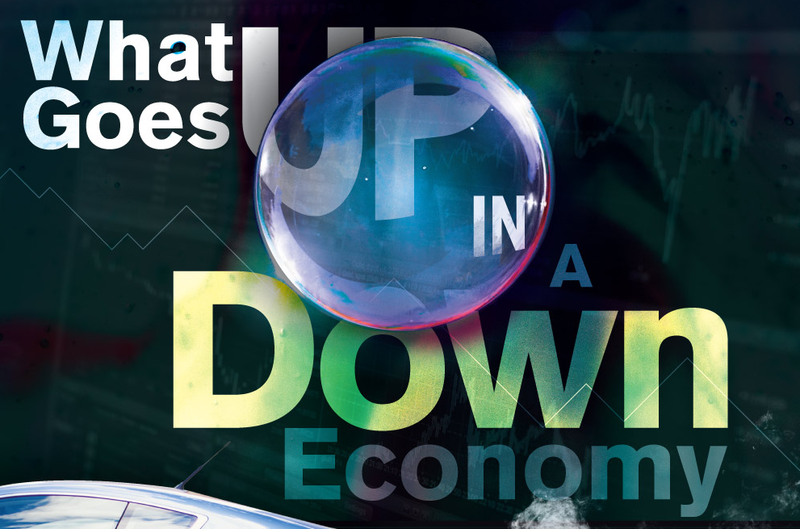 But while economic downturns aren’t necessarily surprising, that doesn’t make them any easier to deal with. In 2018, one out of seven Americans were three or more months behind on their auto loan payments, a key indicator of financial trouble. And what we understand from the economy ebb and flow is that what goes up must come down. But not all businesses suffer this fate. In fact, there are entire industries that seem to thrive in a down economy. Small luxuries like cosmetics and skincare, vices like tattoos, cigarettes and tobacco, even candy, are all likely to continue to do well during a downturn. During the Great Recession, consumption of alcohol said steady and sales of alcoholic beverages in the US actually rose by nearly $2 billion. Non-cyclical businesses, like tax services and funerary businesses, will likely always be in need; yet while they survive, services offered and consumer demands shift in the face of an economic downturn. Cremations are often much less expensive than a traditional burial and have, unsurprisingly, been on the rise over the last decade. As they say, the only two certainties in life are death and taxes; US accounting firms themselves have declined at a rate of .3% every year since 2008, but the job sector as a whole experienced growth. Retail shopping, both discount and luxury, has shown growth on both ends, giving us a glimpse into the personal, family-level effects of recessions of the rich getting richer and the poor getting poorer. Though there are some industries that seem almost immune to the effects of economic dips, that doesn’t mean we all need to pivot our business into a funeral home or a candy manufacturer. Instead, the takeaways we learn detail a larger picture revealing sustainability, responsible spending and budgets, inventory management, and, perhaps most importantly, mastering core competencies. In other words, survivable businesses zero in on what they do already do best and then do it better than competitors to survive a downturn. See this infographic for more on the secrets of surviving an economic downturn, what hangs in the balance of success, and how your own business can stay afloat no matter how far the economic bar dips.